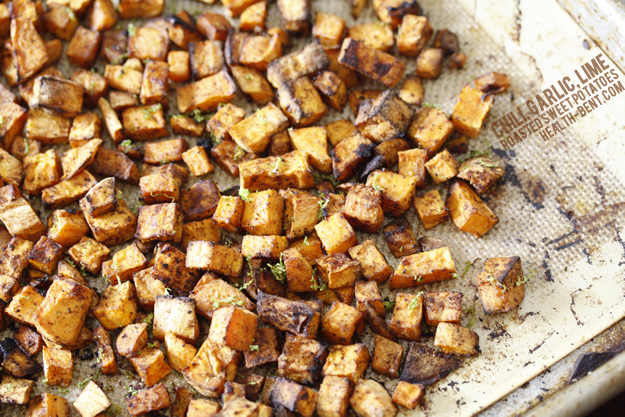 Step 2 Place sweet potatoes on a large baking sheet, topped with a silicone mat, and toss with lime juice, chili powder, garlic powder, salt and about 2-3 tablespoons of oil. Add enough so it looks like everybody is coated well. Step 3 Cook, undisturbed, until the sweet potatoes are soft on the inside and crispy on the outside–stirring around every 15 minutes–for about 30-45 minutes total–depending on how small your sweet potatoes are. Step 4 Once the sweet potatoes are done, place them in a serving bowl, and toss with the reserved lime zest and taste for flavor–usually needs a bit of salt. I know it’s been quite some time since I’ve posted anything–and I don’t really see that changing much in the future. A few reasons why: a.) We’ve got our fingers crossed that our CrossFit gym will f.i.n.a.l.l.y. be open by the end of November, which means virtually zero time logged in the kitchen and b.) I’ve been doing a lot of reading and I’m pretty much “out of love” with the Paleo Diet, the circle jerks, the zealots, and the “true believers” that go along with it. Honestly, I’m not sure where I am with it, regarding this website. I’m a chronic self-experminter when it comes to diet and I most certainly don’t mean detoxes, deprivation or 30-day challenges–extremes that go hand-in-hand with Paleo. Neither of us believe in that–and we wrote about it on our book. I mean looking at what people with differing opinions have to say about food, diet, performance, quality of life, etc. and I plan on writing about what I’ve been eating and reading, probably next week.